Black Bean Dip Recipes - No, they are not fattening! Black bean dip recipes are more than acceptable for people managing their weight. All beans are low glycemic and have so much fiber they are fine to eat on a weight loss program! You do need to use low fat sour cream but it's still rich and very tasty. Especially if you are making this for guests by all means put out chips and raw vegetables. If you are eating it with chips you can bake sprouted corn tortilla chips to go with it. See the recipe below. Easy to do and they taste better anyway. All sprouted grains are low glycemic. Eden organics is a good brand for canned black beans. Drain them thoroughly and put them into a blender with the sour cream. Blend with the seasonings just until it's smooth leaving in small chunks of beans. Put the mixture into a bowl and then add the rest of the ingredients and stir well. Stir thoroughly and store in the refrigerator. Be sure to take it out an hour before you intend to serve it as it tastes much better at room temperature. You can also make this recipe with aduki beans which have excellent flavor. Put all the ingredients in a blender and blend until it's smooth but still chunky. Heat the oven to 400 degrees. Cut or tear the tortillas into quarters and put into a large bowl or divide up the ingredients and into 2 batches to mix. Put the oil in first and stir thoroughly to cover all the pieces. Add the salt and stir some more. Place on 2 – 3 cookie sheets so you can get them in one layer. Bake for 7 minutes or so, take them out and turn them. Bake 7 minutes longer or until they are crispy. Figure on two tortillas per person and double the recipe as needed for a party. Having store bought chips on hand for those who don't care about a healthier version makes sense. They’re ready for dipping! All black bean dip recipes call out for chips and homemade tortilla chips are the best! These will not raise your blood sugar. You could put the black bean dip on a low glycemic whole grain cracker or just use it as a dipping sauce. You could even make an open faced sandwich and have it for a lunch meal but be sure to put it on sprouted whole grain bread, like the Ezekiel brand. Add sliced tomato, lettuce and sliced red onion for an open faced sandwich. The good news is that beans and fats together are quite filling so if you have this spread for lunch with some fresh fruit or a salad it will be a satisfying meal that won't leave you wanting more. Black bean dip recipes are actually pretty healthful considering that black beans have lots of phytoestrogens which are plant compounds that act very much like natural hormones. Beans are full of fiber and are a complete protein when served with whole grain brown rice. Beans also help to control your blood sugar and keep your cholesterol low! Return from Black Bean Dip Recipes to Low Glycemic Recipes. 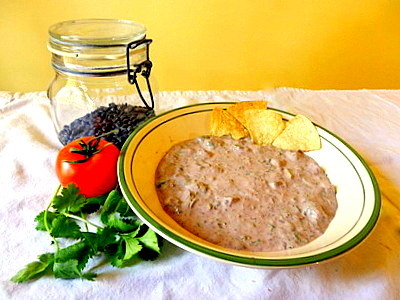 Return from Black Bean Dip Recipes to Lifetime Fat Loss home page.